A recent report intrigued me. Given the recent uprising of data, data and more data, things are getting a bit absurd about the voluminous data we are collecting and storing. The flip is that we might need all these data for analytics and getting more insight from the data. 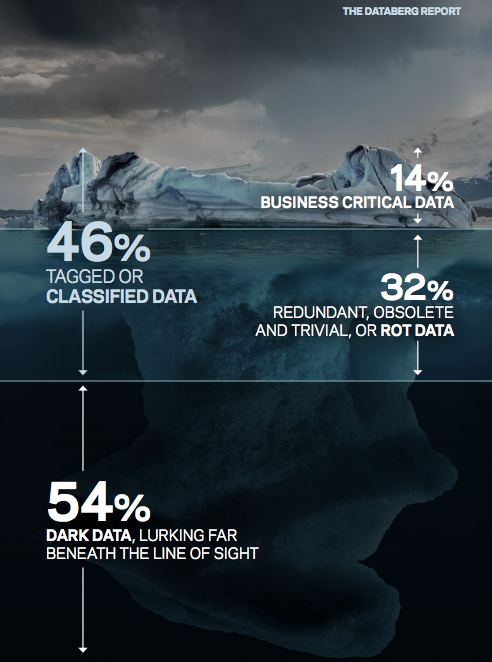 From the screenshot above, it shows 54% of the landscape surveyed is dark data, unseen and clogging up the storage. And in an instance, the Darkberg (cross of “Dark” and “Iceberg”) report knocked a lot of sense into this whole data acquisition frenzy we are going through right now.